So TfL have produced a short advert once again asking everybody to calm down, play nice, and share the road. I figured it might make a good excuse to post again this thing that I scribbled a couple of years ago. On the Guardian Bike Blog, Tom Richards points out that “while we’d all love better cycling infrastructure, there is neither the money nor the political will…” Therefore we should focus on easier and more populist things — like conquering human nature and legislating to re-educate 30 million people. Now, leaving aside the fact that the effects of changing driver education (if there are ever any effects at all, and it’s not a very robustly researched field) have long lag times — as long as street lifecycles. And leaving aside the fact that there is no evidence that this sort of intervention would ever actually have any significant effect on the sort of issues we’re concerned about, such as occurrence and severity of motor vehicle/cycle crashes (but if Richards were to propose a randomised controlled trial…). And leaving aside the fact that it could have, at best, only a small effect on the arguably more important issue of barriers to cycling, which are more about subjective assessment of the comfort of the environment than about raw injury statistics, and so can make no significant contribution to solving the wider issues which cycling is tied to. Basically, leaving aside the fact that this is, at best, a mediocre proposal. The interesting question is, why do people keep clinging to these kinds of ideas? Sure, segregation would be great but in London at least there’s no room and no money so it’s not going to happen. And there you have the ‘realism’ of a man who is LCC Trustee and Vice Chair. But the British tradition of soft measures goes far wider, deeper and further back than this. Motorists may moan about having been the victim of a “war” that restricts their freedom, polices their movements, or sends campaigns of severe punishment for accidental and unavoidable infringement of petty rules, but the reality is that right from the start, when the red flag acts were repealed, this country’s response (and that of much of the English-speaking world) to the problems that motorists create on the road has largely been light touch and libertarian, in which the children are simply asked again and again to play nice, even as they become ever greater bullies, and only if they’re really bad might they have their pocket money docked. We encourage and raise awareness, appeal to the legendary British sense of fair play, and still believe that the ideal road is within reach if only we can persuade everybody to get along through courtesy, good manners, and communicating our intentions clearly to one another. They say that the definition of madness is doing the same thing over and over and expecting a different result. For eighty years or more the answer to motorists playing nice has been just a little bit more education and awareness raising, and look where it has got us. It’s time to call off the search for the British sense of fair play and abandon the naive idea that meaningful and worthwhile change on the road can be achieved with a few gentle nudges. Isn’t it weird how everyone’s getting so fat and dying of cardiovascular disease and cancers and diabetes? Why is that? I guess it’s genetics or something. Meanwhile, I stumbled upon this in a folder of old unprocessed pictures. It was on New Cross Road back when I lived in that part of the world. 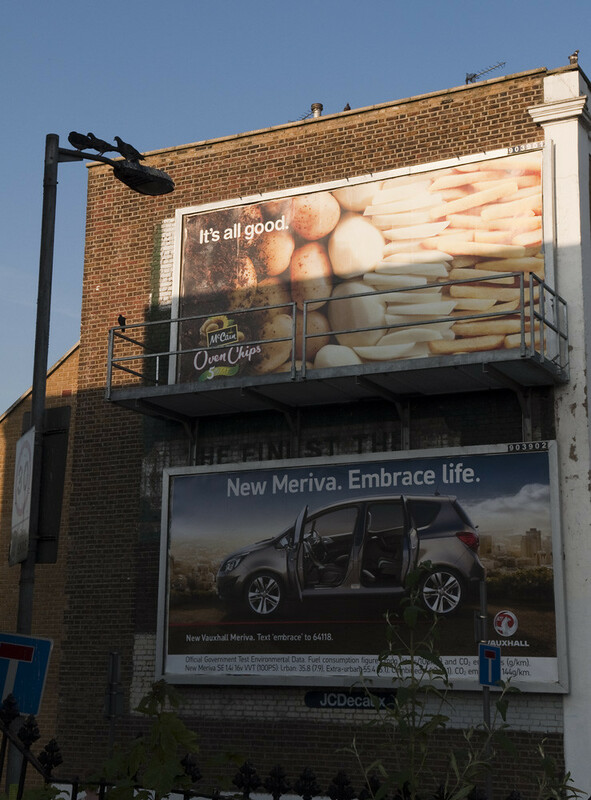 There are a lot of billboards along the Old Kent and New Cross Roads, targeting the motorists who pass though, destroying and polluting other people’s neighbourhoods. Whether governments try to change our behaviour or not, you can bet that commercial interests will be doing their best, explicitly or subtly, and even by ensuring that our choices are restricted. On the lower advert you can see a government nudge: the provision of information about the fuel efficiency of the car being advertised. 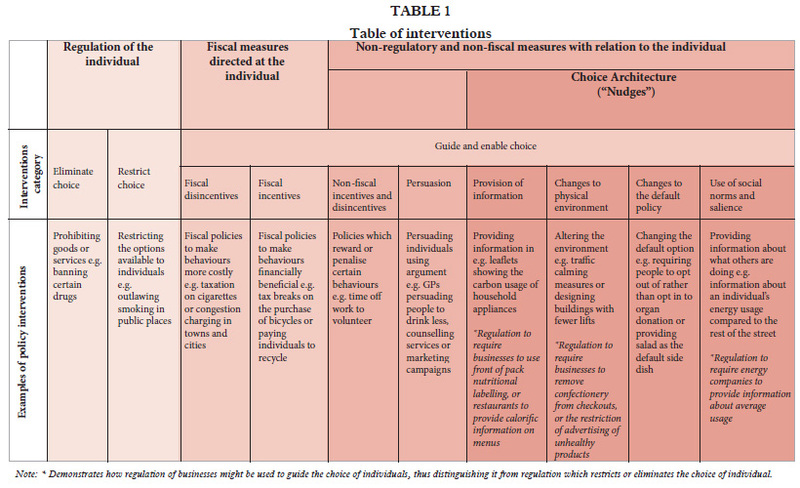 The HoL Sci & Tech Committee report on behavioural change commented on this “information deficit” model of harmful behaviour, concluding that information provision on its own is generally insufficient to lead to behavioural change (though it can help to pave the way for more robust interventions). The real barriers to a low-carbon lifestyle are bigger than a lack of information about fuel use. A more helpful move might be to prevent advertisers from making such absurd claims as that junk food is “all good” or that cars are anything other than life-sucking parasites. We don’t let tobacco and alcohol companies do it.